Tuesday’s 2-1 Giants loss to the Houston Astros felt eerily similar to Monday’s 3-1 loss. The Giants held tight to a one-run lead for the majority of the game after receiving a seven-inning, shutout pitching performance from their starter. But instead of the three-run Astros home run that took place in the ninth inning last night, the Giants instead allowed a two-run home run in the eighth. Ray Black – who hadn’t allowed a hit since his debut against the St. Louis Cardinals on July 8th – had his second-worst game of the season. After a leadoff double and a strikeout, Astros first baseman Tyler White hit a home run to left field that was nearly identical to left fielder Marwin Gonzalez’s ninth-inning jack last night. The Giants had a chance to put at least one run on the board in the seventh inning, following a leadoff triple from Alen Hanson. Hanson who was replacing Chase d’Arnaud, who gave the Giants a 1-0 lead in the second inning. The lead lasted until the eighth, but d’Arnaud only lasted until the fourth. He fouled a ball off his left knee, leaving the game with a contusion. Despite the triple from Hanson, the Giants could do nothing with it. Steven Duggar fouled out before Hunter Pence and Andrew McCutchen both struck out, leaving Hanson stranded. But that’s been the tale of this season. It’s one of mediocrity and wasted opportunities. With the loss, the Giants (57-58) are now one game below over .500. That’s a line that probably feels all too familiar to read. This team has by far the most days of one or fewer games at .500 this season with 67 days coming into today’s game. The next-closest team is the Washington Nationals, with 50 days. The loss – like last night’s loss– feels like a greater waste than normal because it followed a second-straight Giants pitching gem. 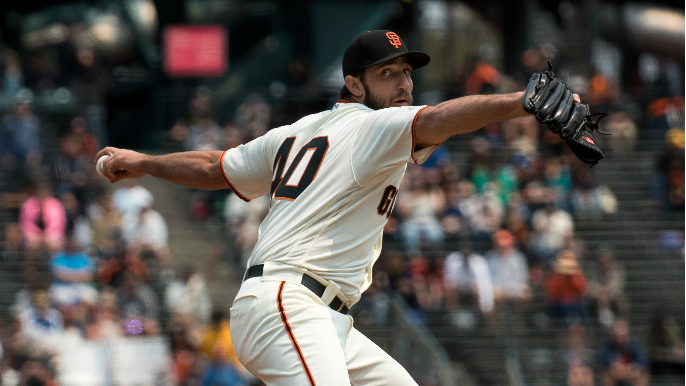 After Dereck Rodriguez had seven strikeouts and allowed no runs or walks through seven innings of three-hit baseball last night, Madison Bumgarner fancied himself a similar day. While Bumgarner allowed five hits and three walks (one intentional), he had an otherwise identical stat line to Rodriguez. Bumgarner racked up seven strikeouts and also denied the Astros from scoring a run in seven innings. The Giants are now six games back of the second National League Wild Card spot following the loss.